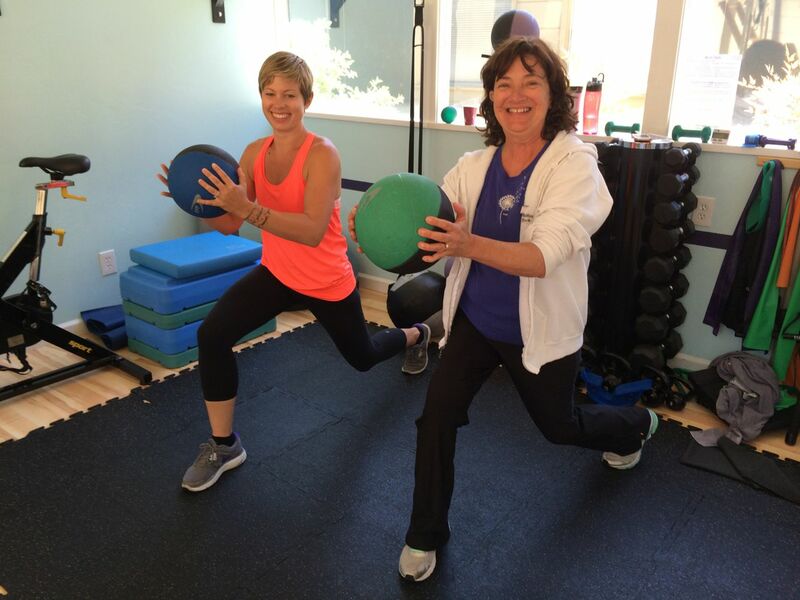 Shannon Shearn, personal trainer and Kathy Buck Thomson, instructor teach a PWR!Moves™ Circuit Class at RIBS in Menlo Park. August 30, 2014 | by Darcy Blake | When you’re diagnosed with Parkinson’s Disease, it isn’t long before you start assembling a team that will keep you living well for as long as possible. Just as a novice chef tackles a complicated recipe, you may find yourself gathering ingredients you’ve never used before, such as a neurologist, a movement disorder specialist, possibly a neurosurgeon, a speech therapist, an internist, physiatrist, a physical therapist, a personal trainer or a fitness professional. An important part of the recipe for Parkinson’s disease treatment is exercise, because it optimizes your ability to function. “Use it or lose it, use it and improve it,” is a favorite saying from Dr. Claire McLean, PWR!Expert and Neurologic Clinical Specialist of Hoag Hospital in Newport Beach. To become a physical therapist you have to go to graduate school. Now most all programs are doctoral programs that you must graduate from before obtaining a license to practice. “Physical therapists have PT after their name to denote a physical therapy license. If you are seeing a physical therapist, investigate how much experience they have working with people with PD, and ask if they have taken training courses such as PWR! or LSVT BIG,” explained Dr. McLean. Certified personal trainers (CPT) usually have a 4-year degree in kinesiology (the study of human motion), exercise physiology, or exercise-related fields and a Personal Trainer Certification. Many fitness centers require instructors to have a college education in exercise, nutrition or wellness, according to the Bureau of Labor Statistics. College majors may include exercise science, physical education or kinesiology. Fitness instructors should also have training in cardiopulmonary resuscitation, or CPR, either in college or through the Red Cross. Many fitness instructors pursue certification from various agencies, which may depend on the exercise programs they choose to teach. Dr. Claire McLean, DPT, NCS is a Board Certified Neurologic Clinical Specialist. She graduated with a doctorate in physical therapy from the University of Southern California and has specialty training through the University of Southern California/Rancho Los Amigos Neurologic Physical Therapy Residency program. At Hoag Hospital, an NPF Care Center, Dr. McLean works in the outpatient rehabilitation clinic primarily with clients with neurologic dysfunction with an emphasis on Parkinson’s disease and other movement disorders. Dr. McLean also is an Adjunct Faculty member instructing in USC’s entry-level doctorate program. She has instructed in continuing education courses on the topics of self-efficacy and executive function training for patients with neurologic dysfunction as well as for the LSVT® BIG program. Dr. McLean is now a PWR!Expert and continues to work closely with Dr. Farley, and PWR! on the PWR! Workshops and the PWR! Retreat. Scott Lohman, fitness professional has been teaching Adapted PE (physical education which has been adapted or modified) since 2002. He has a B.A. in Kinesiology from San Francisco State with an emphasis in Adapted P.E. He also has a M.A. in Gerontology with an emphasis in Fitness and Aging. Scott, in the field of fitness for over 20 years, has taught at the College of San Mateo, Cañada College and Foothill College. Lohman enjoys the challenges of working with individuals who have multiple mobility and physical limitations and teaches students with developmental disabilities. He teaches several fitness classes for the City of Redwood City including a PWR!Moves™ Circuit Class, for advanced level adults.